Are you a DIY type? Do you wish you had Jen & Kerry around as a desktop reference? 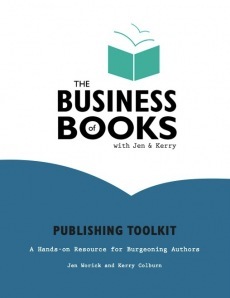 Then our Publishing Toolkit is for you. This invaluable resource, available as a binder or PDF, will walk you through the proposal process and beyond, including insider tips on submissions, contracts, publisher relations, and more. With 100-plus pages of publishing intel plus exercises, worksheets, and two sample nonfiction proposals, it’s a steal at $99. Looking for something other than what you see here? We’re happy to discuss the unique needs of your project. Email us for rates and details.